Jared Kushner, senior adviser and son-in-law to President Trump, lost his “Top Secret/SCI” level of security clearance Tuesday. He is now at the “Secret” level, which is what White House butlers and gardeners are given, simply to be allowed on the premises (while promising to keep their mouths shut about observing any palace intrigue). In the aftermath of the Rob Porter affair, scores of other important staff members also had their security clearances downgraded. Most experts believe losing his clearance — therefore, losing access to the Top Secret President’s Daily Brief — will ultimately prevent Mr. Kushner from working on tasks the president has assigned him such as achieving Middle East peace and convincing Mexico to pay for the wall. But the burning question on every White House staffer’s mind is this: Who, now, will draw the stick figure diagrams to explain the PDB to Donald every day? All seriousness aside, this appears to be an administrative victory for Chief of Staff John Kelly. The president ostensibly left it up to Kelly to decide if Jared should lose his temporary clearance (because it has extended far beyond normal “temporary” guidelines). Mr. Trump legally could override the FBI’s declination of permanent security clearance status for anyone he chooses, and many pundits thought Trump would do just that with his son-in-law. Other experts, however, believe this was the president’s way of delegating the dirty work to Kelly for a chore Donald determined necessary. He determined this because it’s now apparent the FBI hasn’t authorized — and likely won’t ever authorize — permanent clearance for Jared because he’s suspected of (among other things) mixing personal business with diplomatic pleasure. Moreover, these suspicions likely have connections to the Mueller Russia probe. Blood (even in-law blood) is thicker than water but not as thick as self-preservation. Let’s be clear: the primary reason Jared was given his presidential adviser job was to enhance his foreign connections for business purposes (which is likewise the central motivator for President Trump). And everything was fine until former White House Staff Secretary Rob Porter’s pesky ex-wives blew the whistle about his wife-beating tendencies and ruined Rob’s chances for permanent clearance. He, like Jared, also had been working under improperly extended temporary clearance. Meanwhile, Donald is thinking, “Doesn’t this guy know about NDA’s and hush money?” Rob’s situation cost him his job and exposed the entire temporary-security-clearance-abuse scandal to the world. He spoiled it for everyone. Donald Trump has been tested many times since ascending the presidency. He’s consistently flunked. On Valentine’s Day, February 14, 2018, a disgruntled, mentally ill former student shot and killed 17 Marjory Stoneman Douglas High School students and adults in Parkland, Florida. Eight days later, President Trump teamed up with the National Rifle Association and now is pushing his top gun-safety goal: the arming of hundreds of thousands of teachers with concealed weapons in U.S. schools. Trump is proposing that volunteer teachers who are “adept” with guns go through special training. “[We’ll] give them a little bit of a bonus,” said the president, later suggesting $1,000 per year. 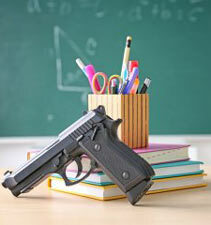 He speculates that 10 to 40 percent of teachers could be armed, and the bad guys won’t know which ones. “We have to harden our schools, not soften them. … [This would] solve the problem instantly.” Donald used the word harden about a dozen times during his televised remarks. He was echoing one of the key talking points the NRA has been promoting since the 2012 massacre of 20 first-graders and six educators at Sandy Hook Elementary School in Newtown, Connecticut. The Sandy Hook shooter, like the Douglas High School shooter, was another mentally deranged young man with access to semiautomatic weapons. Most gun-control advocates argue that even if arming teachers was a reasonable, smart solution — which it isn’t — it would have no effect on all the non-school mass shootings. They contend the best response would be to ban the sale and ownership of automatic and semiautomatic weapons. They also contend that since the late Justice Antonin Scalia and the Supreme Court have ruled there is no Second Amendment right to own automatic and semiautomatic weapons, and that the Constitution does allow for regulation of firearms, there would be no legal or constitutional restrictions against such a ban. After being presented with the argument that arming teachers won’t solve the problem of mass shootings in non-school situations, the president has taken the initiative to draw up a detailed plan to answer those objections. It’s believed to be the first time during his presidency Mr. Trump has written anything other than his signature. Donald made it clear that in these situations, he works best by keeping his own counsel because, you know, he’s, like, a smart person; therefore, no advisers were involved in developing the plan (though Communications Director Hope Hicks copy edited the ubiquitous misspellings, erroneous capitalizations, and overused superlatives and exclamation points, then word-processed the final version). Notable Event — 6 killed, 3 injured at the Sikh Temple of Wisconsin in Oak Creek, Wisconsin, by Army veteran and white supremacist Wade Michael Page, Aug. 5, 2012. Plan — At every U.S. Sikh temple, multiple copies of the Guru Granth Sahib (the Sikh holy book) will be hollowed out. Each will conceal either a Beretta 96A1 or Colt 1911 (.45 ACP) handgun. This way, the bad guys will be afraid to enter the building because they won’t know which holy book is hiding a weapon. In the event a shooter does enter, half of all temple attendants will be required to conceal a loaded gun in their turbans, with the safety off for quick response. Volunteers will train in weapons defense tactics. In return, they will receive a bit of a bonus: 10 percent more spiritual knowledge and wisdom per year. Notable Event — 8 killed, 4 injured at Westroads Mall in Omaha, Nebraska, by 19-year-old Robert Hawkins, Dec. 5, 2007. Plan — In every United States shopping mall, effective immediately, one out of every three smartphone kiosk attendants, Cinnabon Bakery workers, and Coffee Beanery baristas (and mall Santas, when appropriate) will carry a concealed weapon. Shooters will be afraid to enter the mall because they won’t know which minimum-wage worker might fire back. Volunteers will get specialized firearms training. In return, they will receive a bit of a bonus: employee-of-the-month parking all year long. Notable Event — 12 killed, 58 injured at the Century 16 movie theater in Aurora, Colorado, by 24-year-old James Holmes, July 20, 2012. Plan — In every movie theater in America, effective immediately, several large containers of buttered popcorn will be scattered throughout the seats. Every other one will conceal, again, a Beretta 96A1 or Colt 1911 (.45 ACP) handgun. Potential shooters will be afraid to enter the theater because they won’t know which bucket of tremendous oily goodness holds a weapon. Also, at least two theater ushers working every film presentation will be required to carry a gun. They will attend after-school firearms training. In return, they will receive a bit of a bonus: a 5 percent discount on popcorn. Notable Event — 6 killed, 11 injured at a “Congress on Your Corner” meet-and-greet in a grocery store parking lot in Tucson, Arizona, by 22-year-old Jared Lee Loughner, Jan. 8, 2011. Plan — At all supermarkets, effective immediately, one out of every three checkers, baggers, and shopping cart collectors will carry concealed weapons. Volunteers will engage in specialized firearms defense training. In return, they will receive a bit of a bonus: automatic cuts in line to buy break snacks, to maximize their break time. Notable Event — 8 killed, 1 injured at crowded Salon Meritage in Seal Beach, California, by 41-year-old Scott Dekraai, Oct. 12, 2011. Plan — All nail techs will carry concealed weapons. Notable Event — 6 killed, 2 injured at the offices of Accent Signage Systems in Minneapolis, Minnesota, by 36-year-old Andrew Engeldinger, Sept. 28, 2012. Plan — Half of all secretaries … I mean, administrative assistants, will carry concealed weapons. Notable Event — 9 killed at Emanuel African Methodist Episcopal Church in Charleston, South Carolina, by 21-year-old Dylann Storm Roof, June 18, 2012. Plan — 17 percent of all Methodist churchgoers in America will carry concealed weapons. Notable Event — 49 killed, 58 injured at the Pulse nightclub in Orlando, Florida, by 29-year-old Omar Mateen, June 12, 2016. Plan — 33 percent of all servers and bouncers in the U.S. will be packin’ heat while on the job. Notable Event — 59 killed, 500-plus injured at a country music festival outside Mandalay Bay Resort and Casino in Las Vegas, Nevada, by 64-year-old Stephen Paddock, Oct. 1, 2017. Plan — 22 percent of hotel maids and band roadies must be carrying a friend. My regular readers know I would never disrespect shooting victims or their families who have endured these horrendous, needless deaths and injuries by gun violence. I have only deep reverence for them. My sardonic disrespect and enmity is aimed at President Trump who stupidly and selfishly promotes only gun-violence remedies the NRA can stomach: namely, arming teachers. Their answer to the problem of too many guns is more guns. Yes, the president currently is giving fleeting lip service to background checks and bump stocks. But he does not mean or believe what he says. These are self-serving lies. Mr. Trump has proved he will say whatever he thinks people want to hear in the moment, with no intention of following through. Think DACA reauthorization. Think health care improvement. Now think gun safety. Banning automatic and semiautomatic weapons. Universal background checks, with no loopholes and greater data-input participation. Longer waiting periods. Limits on magazine capacity. These are all remedies permitted by the Constitution, with no violation of the Second Amendment (per a conservative Supreme Court), notwithstanding the disinformation campaign by the NRA and their obsequious donor recipients. Even those legislators who tout that they get no campaign funds from the group are still dependent upon the letter grade the NRA bestows on each one, measuring their level of gun-rights purity. And purity means zero support of any measure that restricts guns, no matter how minutely.